They Call This a "Custom Look"
I took photos with the good camera, but the little gadget that I use to transfer photos has run away. I hope to find it and post those photos soon. These came from my pitiful iPhone. Not so great, but they'll suffice for now. 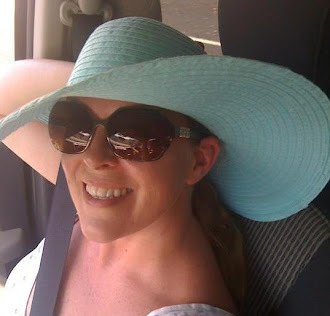 I need to backtrack a bit after this post, but I have to share my latest "oops" in the renovations. In early August, Mr. Vagabond and I built a window seat flanked by two book cases in the living room. It turned out amazing. Much better than we hoped. Now I'm working on the bench cushion for the window seat. At midnight last night, I thought it was awesome, too. When I ironed it this morning, I discovered a piecing error. After I took the pictures, I noticed another. Oh, well. I've decided to leave it as it is and call it beautiful. At first glance, it seems fine. But my primary goal was to avoid any series of one fabric. As I ironed it, the diagonal row of red popped out. Then, of course, the salmon-toned row that runs opposite jumped out. After I took these photos, I saw the black and gold diagonal run just left of center. 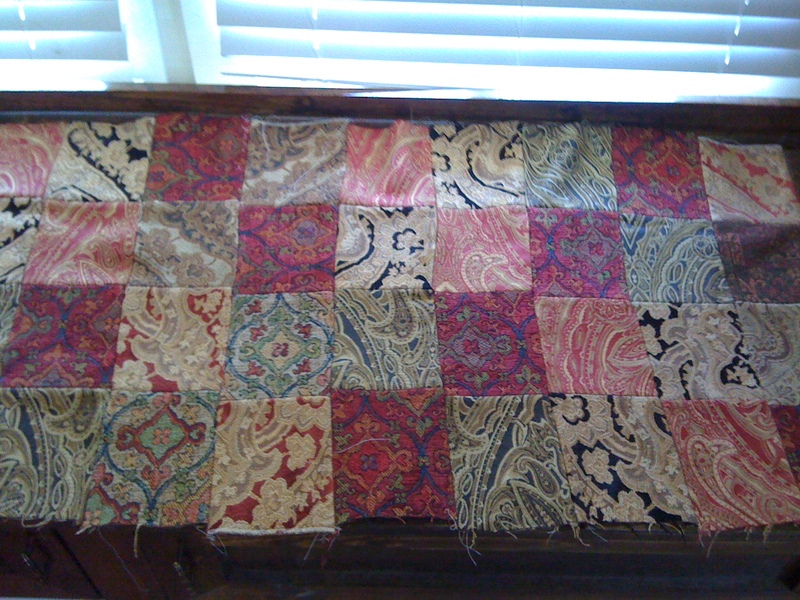 Although I am disappointed with the mistakes and a few odd, misaligned seams, I'm thrilled with the quilt top fabric. Years ago when I worked for an interior design office, I brought home tons of old fabric sample books. They've been stored in the garage for at least 6 years. 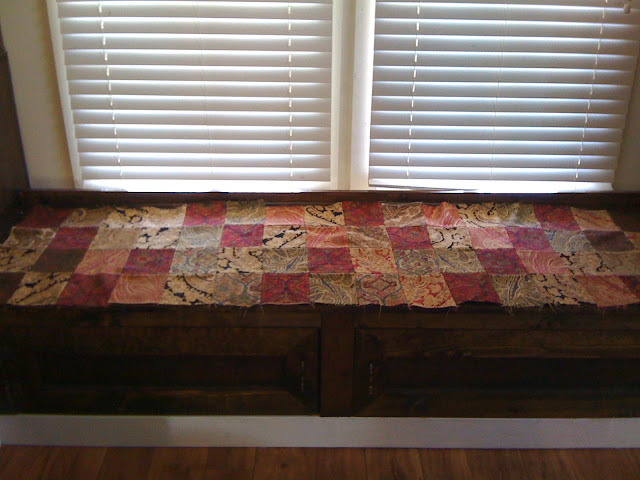 When we finished the window seat and book cases, Mr. V. told me that he thought I should make a quilt cover for the bench seat cushion from all of the old sample books. You can't really see the texture of the fabric, but it's gorgeous. The black and gold and red and gold pieces are satin threads on velvet. The bright red is wool and feels almost like a tapestry. Every different fabric has a lot of texture. So for now, this is my latest addition to the house.